subroutine You and the Runner secretly spend 0credit, 1credit or 2credit. Reveal spent credits. If you and the Runner spent a different number of credits, move Bullfrog so that it is the outermost piece of ice protecting another server (the Runner continues the run from this new position and is now running on this new server). Bullfrog has seen pretty much no play at all, due to its very strange nature. Once Susanoo-No-Mikoto came out, while a more focused deflector, Bullfrog dropped off whatever little bit of use it might have had. The Psi game requirement makes it not a guarantee to fire, as a four strength code gate it may be slightly more difficult for Yog.0 to break, but not really - there are lots of ways to get -1 strength for Yog’s benefit. It really could not be relied on to fire more than once, and even if it did, it meant that it was no longer on the server originally, making it easier for the runner to get into that server on the next attempt. 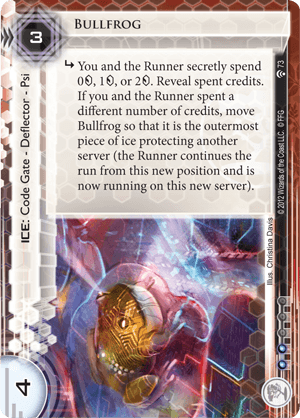 Outside of a combo heavy ICE trap kill deck, where Bullfrog might be used to put the runner into that server after it is setup (but without other cards, the run doesn’t even have to continue) it is unlike Bullfrog will ever see much use.